Santa Mira, California, 1955: Dr. Miles Bennell (Kevin McCarthy) is called back urgently from a medical convention because some of the patients in his cozy medium-small town, fallen prey to some mysterious illness, have been clamoring for his immediate attention. When he arrives home, however, they all claim to be fine, leaving him free to continue his ongoing flirtation with fellow divorcé Becky Driscoll (Dana Wynter). But that initial hint of apparently resolved trouble was only the tip of an iceberg of which he and Becky are going to get to know the full dimensions. As Bennell's patients and friends begin to claim that their closest relatives, people they've known all their lives, are suddenly not those same people (they're the same in every measurable respect, but there's something about the eyes, apparently -- a disturbing new lack of emotion), he becomes more and more troubled, calling in his psychologist colleague, who promptly diagnoses "mass hysteria," probably based on "the troubles in the world." The good doctor thinks he's washed his hands of the matter, but the mystery flares up again in full, exigent force when a close friend and, even worse, his own beloved Becky discover creepily "unfinished"-looking, corpse-like replicas of themselves that have appeared suddenly in living rooms and basements from who knows what provenance and for unknowable reasons. As it turns out, unless the doctor and Becky can stop them, there will be one of these replicas for every man, woman, and child (on America or on earth; for the purposes of the film, they're interchangeable) -- an identical organic being that eliminates you, leaving in your stead a happier (because emotionally lobotomized) version of yourself, one that can never feel love, joy, grief, pain, or desire. But will this new, placid, even-keeled, never-suffering self be human? It's an important consideration, but nobody's being asked whether they want to go along with the rapidly spreading process of switching out and upgrading of vulnerable souls for indestructible soullessness; it happens, painlessly and regardless of your will, while you sleep. 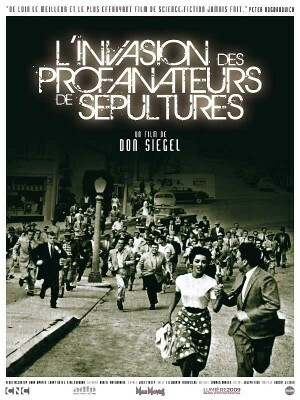 That's the dispiriting, apocalyptic scenario singed onto celluloid in Don Siegel's oft-remade Invasion of the Body Snatchers, a film that has been much discussed (best by J. Hoberman in his book on Cold War cinema, An Army of Phantoms) for its eerie allegorical potency, much of which has to do with how closely it resonates with issues that were salient at the time it was made and, in many ways, are just as relevant now: Individualism vs. conformity, or the profound fear of some jeopardizing presence, some secret, creeping, malign and unstoppable "takeover" destroying the United States (it was the Reds back then; you could replace that fairly easily with "Sharia law" or "socialism" in our own American time, or with the kind of unstoppable, inexplicable national groupthink that has led us into never-fully-rationalized wars, as your thoughts and opinions dictate). But all those metaphorical possibilities offer themselves up tantalizingly from Invasion of the Body Snatchers, like so much ripe, highly allusive fruit plucked easily from the narrative vine, mainly because there's a strange, indelible dramatic force at work, belying its superficial B-movieness and making its conflict and threat so urgent that it really begins to matter for what, if anything, it might be a metaphor. As always, it's not really what the story is, but how it's told, and Don Siegel displays the sort of close-to-the-vest, under-the-radar mastery of richness-maximized pulp storytelling that kept has kept generations of cinéastes in thrall to the works of fellow Hollywood B-movie auteurs, like Jacques Tourneur and Robert Aldrich, who scaled great heights with unknown actors and supposedly low, tawdry, or sensationalistic/frivolous story material. 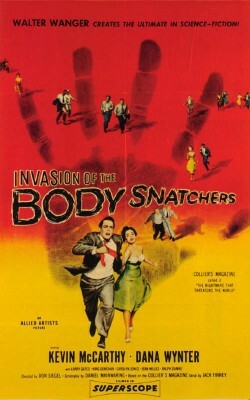 Siegel's storytelling in Invasion of the Body Snatchers is brisk, dynamic, exceedingly well-controlled and assured; the film runs only 80 minutes, but nothing ever feels rushed. Working from a lean blueprint provided by screenwriter Daniel Manwaring (adapting and streamlining the story, very aptly and very skillfully, from a serially-published story in Collier's magazine), Siegel keeps things moving at a tempo you could snap your fingers to -- a quick but even beat, speedy but smooth; the film's flashback/voice-ever structure lets us hit the ground running, and we never stop, but it's an elegant, tightly controlled sprint. 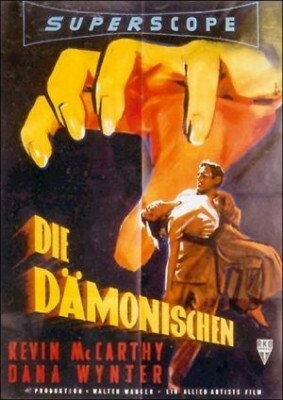 As for the way the film looks (so inextricable from its feeling of forward momentum), there are no pastoral scenes lingered upon, no elaborate camera setups or lengthy tracks or super-composed framings that announce themselves, but some of the things Siegel and cinematographer Ellsworth Fredericks have concocted are nevertheless striking, bravura in their simultaneous logistical simplicity and creation of a highly evocative, sometimes stunning effect. They're especially fond of distinct foregrounding (a pod-person replica's face or the sharp end of a pitchfork fills the lion's share of the screen while our characters are dwarfed back into more cramped corners of the frame), or making a slight, sharp, yet breathtaking tilt-pan up to reframe and reveal more information, action, or development). And the film's best visual -- a simple shot/reverse-angle switching between a tight two-shot of Dr. Bennell's and Becky's increasingly consternated and frightened faces and a not-quite-right shot of pod-hatched townspeople-doppelgangers converging as a giant group, from the edges toward the center of the frame, purposefully but unhurriedly on the town square a bit too early on a Saturday morning -- has no coded fright or pronounced oddness to it; it's just been perfectly calibrated, in mise-en-scène and framing, to create a disconcertingly symmetrical mass movement against a deceptively sunny, healthy, encouraging backdrop. Not very often in movies has something that should look absolutely right and completely "normal" been made to feel so wrong, so menacing, without any phony-feeling, contrived emphasis and without us knowing exactly how, leaving us only with the impressed conviction that the imaginative and enthusiastic director has an amazing, crackerjack intuition for how to derive the best, most lingering potency from the limited resources vouchsafed by a B-movie budget. No less than Siegel's later zeitgeist-baiting, addictively interpretable and re-interpretable Dirty Harry (galvanizing and quibbled over like a searing-hot potato by conservative and not-so-conservative fans for decades), Invasion of the Body Snatchers has no need to take on undue gravity or artificially telegraph some momentous importance to coerce our attention, involvement, and eventual burning need to deduce just what it's so suggestively on about. It's solely through sheer skill, devil-may-care confidence, and carefully built and maintained momentum that it makes you long to know its meaning without once overtly acknowledging that it has any meaning beyond being an extremely well-built, entertaining, emotionally fraught doomsday thrill ride. It gives you something to chew on, but it's all so tasty, making such effortless use of the materials of the medium to tell its story in such a smartly appealing and engaging way, that you dig in eagerly, thoroughly enjoying every tasty bite, only realizing once you're well sated just how full and nourishing the meal has been. The AVC/MPEG4, 1080p transfer, presenting the film at its original "Superscope" widescreen aspect ratio of 2.00:1, is fantastic. All the stark contrast in Ellsworth Fredericks's black-and-white cinematography is present and accounted for; darks are solid as can be, and the picture is sharp, clear, and film-like throughout, with what appears to be most if not all of the natural celluloid texture beautifully preserved, the image otherwise unblemished. Invasion of the Body Snatchers isn't the most visually innovative film ever, but the way it looks here is a treat for the eyes regardless. Olive has given as much care to how the film sounds as they have to the way it looks with a DTS-HD Master Audio 1.0 soundtrack that's also marvelous, conveying the film's original mono sound with wonderful fidelity and clarity. It's amazing how much sound comes out of that one center speaker without overloading or underplaying any level; it's as if you're hearing a newly-struck print being run for the first time on a top-of-the-line (for 1956) theater sound system. No distortion, imbalance, or undue tinniness is present at any point. If you told me the film could ever sound any better than this while still remaining true to the original audio elements, I'd have trouble believe you. Is it a conservative, McCarthyist relic, or a farther-reaching, progressive indictment of Eisenhower-era conformism? 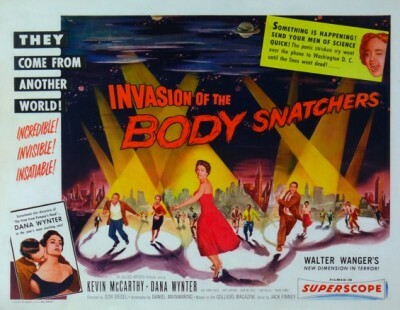 However you read it, Don Siegel's fascinating, captivating original 1956 Invasion of the Body Snatchers is a nifty, ultra-succinct rush of pop paranoia -- an addictive slice of cheese whose unexpectedly sharp, tangy aftertaste is what you really remember. Siegel and screenwriter Daniel Manwaring relate a nation-threatening invasion of "pod people" through the increasingly terrifying experience of one handsome, divorced small-town doctor, but Siegel wrings every shred of suspense out of what you soon forget is the small scale of the film to make the alien invasion feel like something truly eerie and threatening, a real personal nightmare that encroaches upon the deepest, most recognizably human desires and emotions. (The less troubling ending that the studio insisted Siegel include doesn't really dilute that power significantly, either, though you can easily tell where the movie was meant to end, which would have been a more perfect spot.) In taut, economical, but never less than visually astute, resourcefully stylish terms, Siegel takes us quickly past any laughs to be had at the expense of '50s naiveté to plunge us into a nightmarish, lost-cause scenario whose desperation is palpable. It is an immersive experience, never pausing to catch its breath or for reflection (that happens afterward); it's rare for a film to integrate so well its pure thrill-ride fun and its niggling political/philosophical questions, always letting its seething subtext(s) remain just that (though they threaten to burst forth at any moment, which creates a brilliant tension that never lets up. 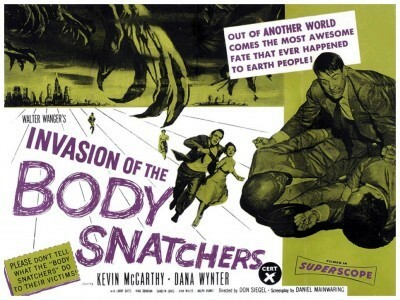 Invasion of the Body Snatchers doesn't put on a single air and has no classy prestige to wear on its sleeve (it ain't An Affair to Remember), but it demands (and deserves, now that it's available on this superb, very conscientiously prepared Blu-ray edition) a place in the collection of anyone who knows and appreciates what a treasure trove of rich pleasures you can find in what at first glance might seem the most unlikely Hollywood productions -- the smart, sneaky way that some of the best, most creative and energized "B" pictures of the studio era can outsmart and outlast the "A"s. Highly Recommended.